The only pouch with a built-in dispensing channel! Just squeeze the pouch and dispense the product. The new SqueezyStraw™ Dispensing Pouch provides an excellent packaging option for personal care products such as shampoo, conditioner, moisturizer, liquid soaps, mouthwash, hand sanitizer etc. used as individual unit dose packs for hotel amenities, travel size packs and samples. Easy to use, ultra-low-cost, one piece design (no separate caps to unscrew) and tamper evident. SqueezyStraw™ Dispensing Pouch is made entirely from low cost, light-weight flexible packaging materials and can be produced in many sizes. A one to three oz. size would cost approximately 3¢ each for packaging materials and royalties, in large volumes (100 million / year). 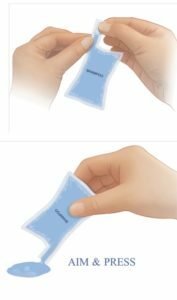 SqueezyStraw™ Dispensing Pouch can be made in many shapes and sizes, and the squeeze feature allows for maximum evacuation. √ Wide variety of shapes and sizes available. SqueezyStraw™ Dispensing Pouch production is done on a horizontal thermoform / fill / seal machine equipped with die-cutting capabilities such as a Multivac. SqueezyStraw™ Dispensing Pouch is a patented technology available for licensing from The Barton Group, Inc. See www.squeezystraw.com for details or call us at 917-647-6388. Click here to download, view or print a PDF of this page.